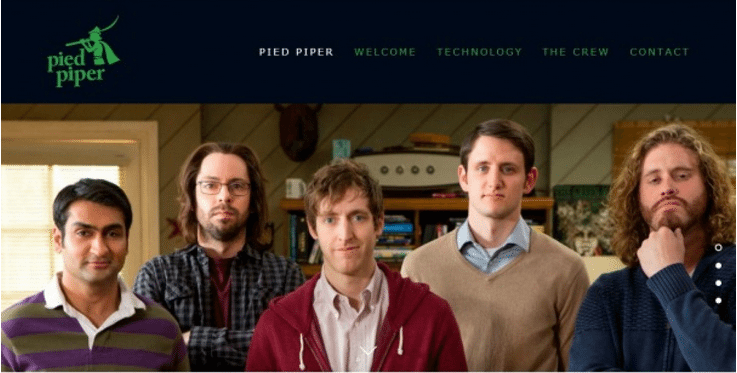 HBO presumably intended its Web site for Pied Piper you know, the fictional start-up in the channel new comedy, Silicon Valley as a cute tie-in to the show. But the site also doubles as something else: a perfect parody of modern Web design. That because this Web site perfectly deploys two web design tricks that are all the rage these days all the rage to the point that they’re virtually cliches. The first is this thing called responsive design, which basically means the page elements will shrink or move around to accommodate different screen sizes. The second is parallax scrolling, basically an animation trick that will cause some elements on the page to scroll faster than others, giving the illusion of depth. The effect here is subtle photos of the actors lag a bit behind the white boxes of text but it still there. On top of that, there are the usual stand-bys: a modern sans-serif font; absurd, self-selected job titles for each of the founders; a candid photo meant to show how hard everybody coding. Put it all together, and you have the formula for 2014 most inoffensive hip Web site! It at least as good a commentary on tech culture as the show.